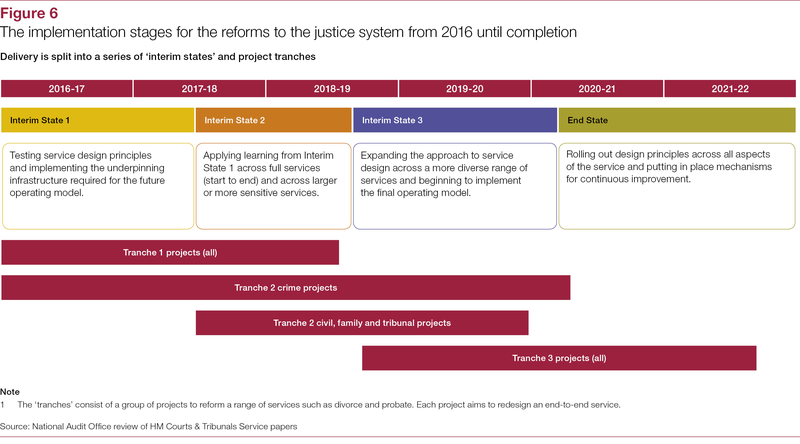 In this report we outline what HM Courts and Tribunals Service's (HMCTS) change portfolio to modernise and upgrade the justice system will deliver, consider early progress against plans and explore how HMCTS and its partners have managed the change portfolio and the risks it faces in the future. 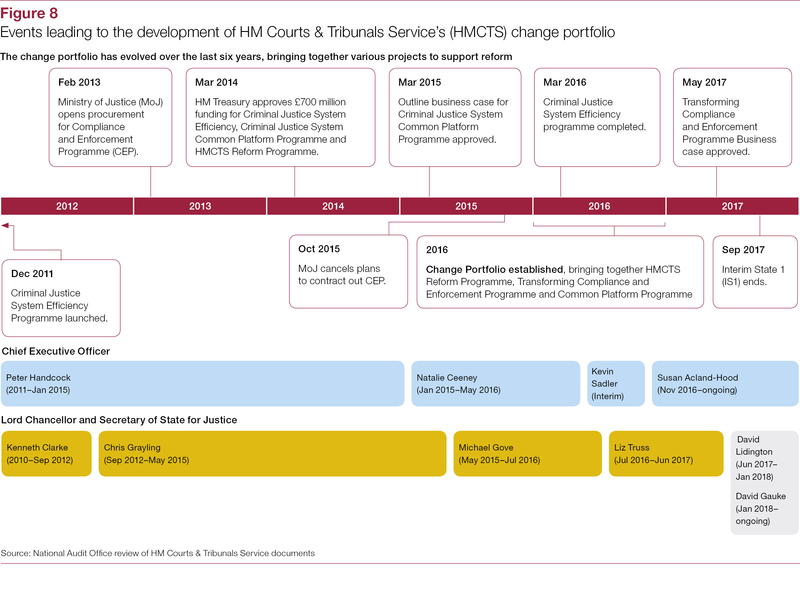 In 2016, HM Courts & Tribunals Service (HMCTS) set up a portfolio of change programmes that will introduce new technology and working practices to modernise and upgrade the justice system. 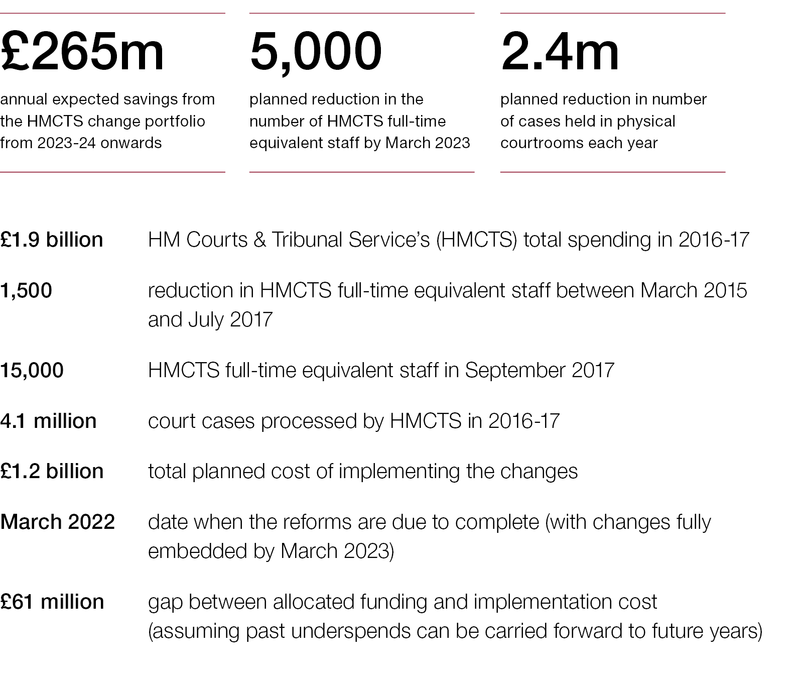 By March 2023, HMCTS expects to employ 5,000 fewer full-time equivalent staff, reduce the number of cases held in physical courtrooms by 2.4 million per year and reduce annual spending by £265 million. 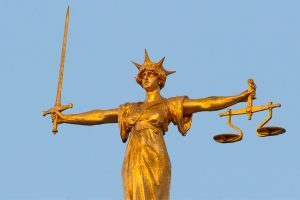 Savings will come from lower administrative and judicial staff costs, fewer physical hearings and running a smaller estate. 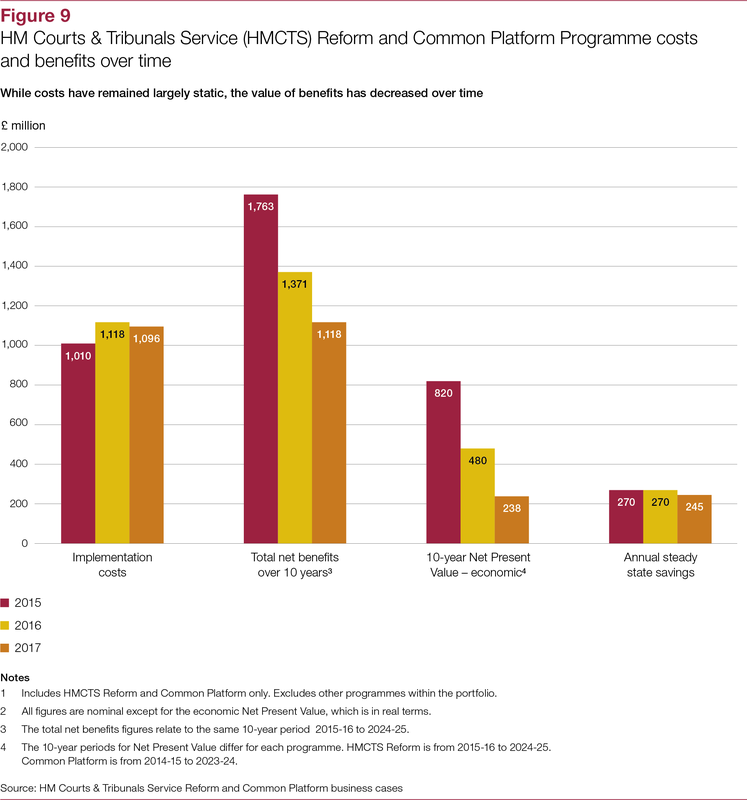 As well as making savings, HMCTS expects the reformed system to work better for all those involved, use court time more proportionately, and make services more accessible to users. 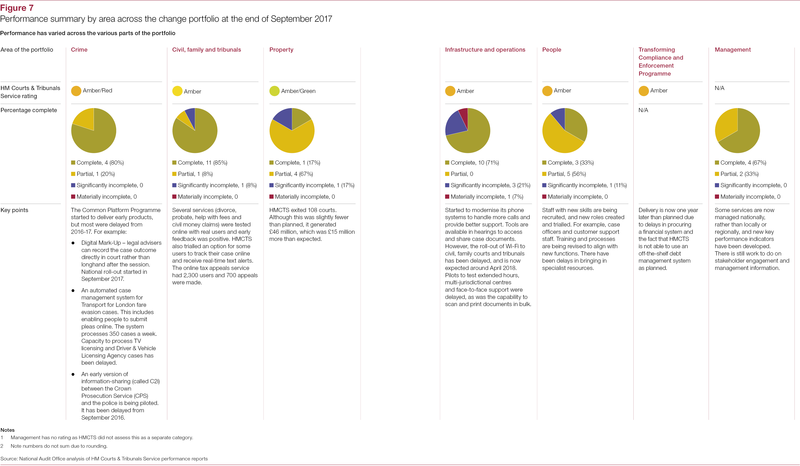 Explore how HMCTS and its partners have managed the change portfolio and the risks it faces in the future. 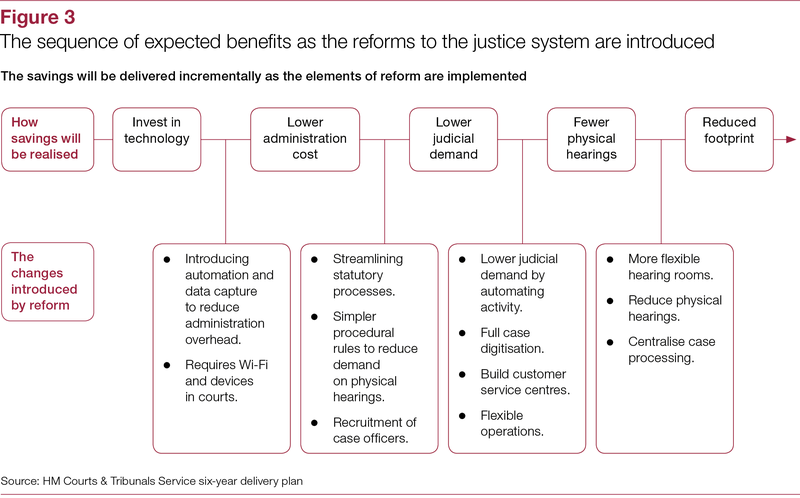 HMCTS faces a daunting challenge in delivering the scale of technological and cultural change necessary to modernise the administration of justice, and achieve the savings required. 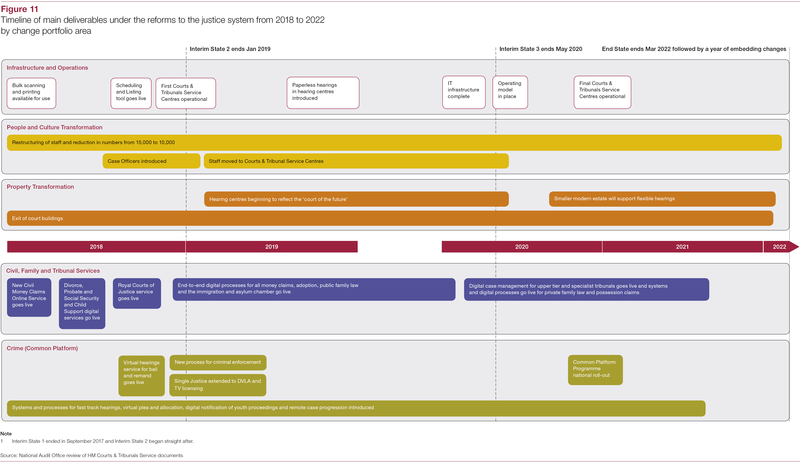 It has responded to early concerns by extending the timetable and improving its governance and programme management. 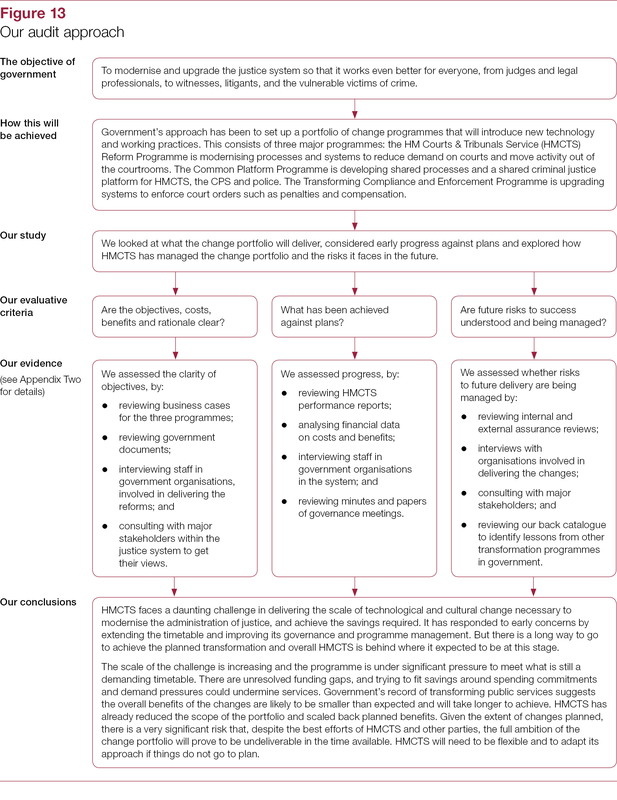 But there is a long way to go to achieve the planned transformation and overall HMCTS is behind where it expected to be at this stage. 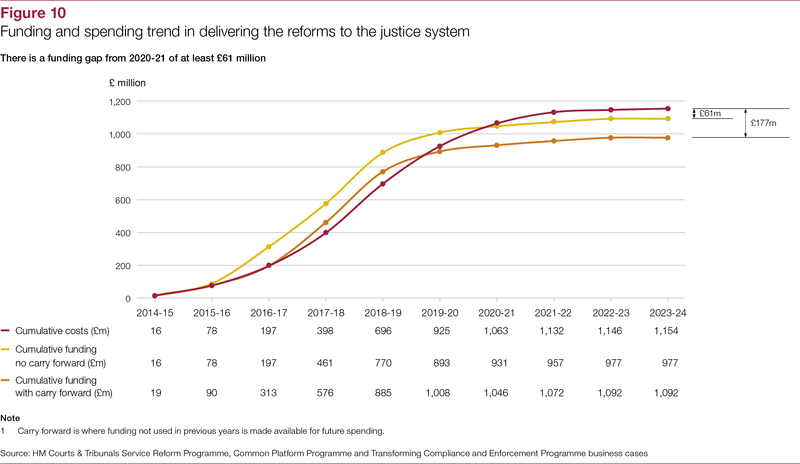 The scale of the challenge is increasing and the programme is under significant pressure to meet what is still a demanding timetable. 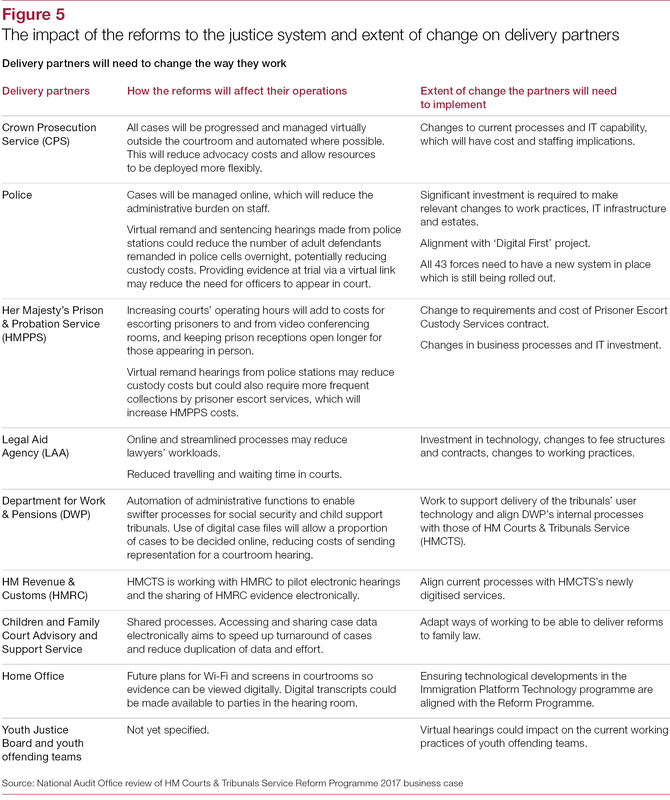 There are unresolved funding gaps, and trying to fit savings around spending commitments and demand pressures could undermine services. 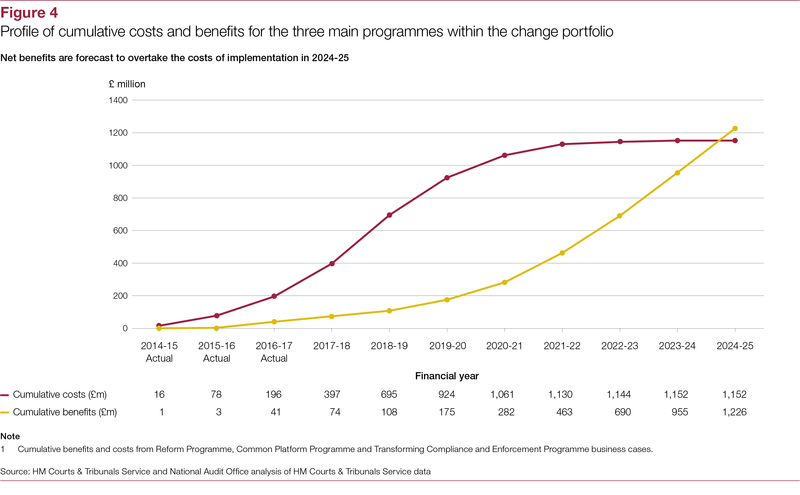 Government’s record of transforming public services suggests the overall benefits of the changes are likely to be smaller than expected and will take longer to achieve. 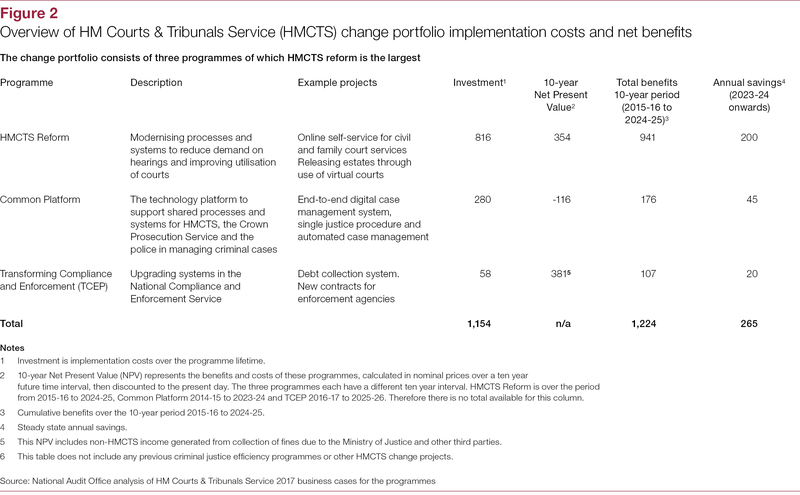 HMCTS has already reduced the scope of the portfolio and scaled back planned benefits. 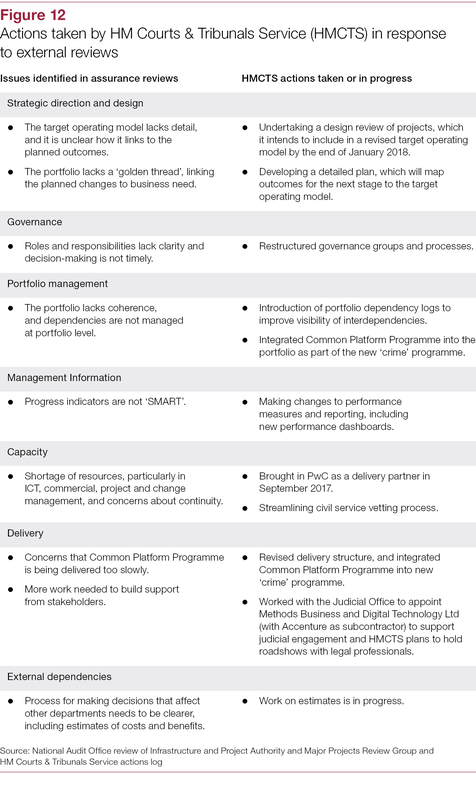 Given the extent of changes planned, there is a very significant risk that, despite the best efforts of HMCTS and other parties, the full ambition of the change portfolio will prove to be undeliverable in the time available. 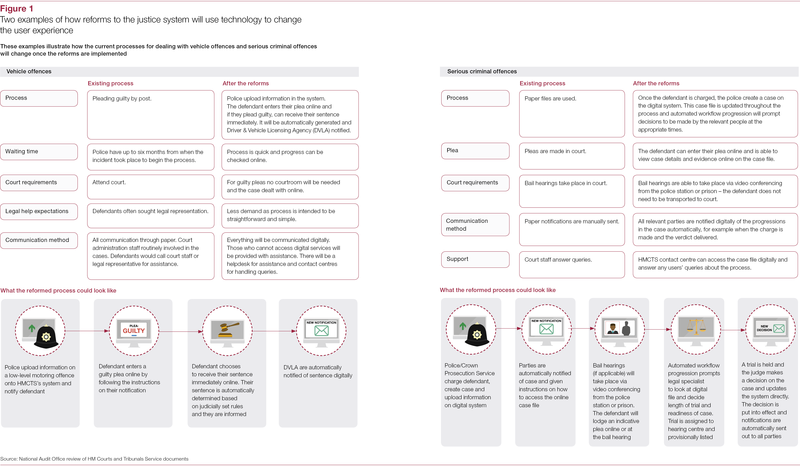 HMCTS will need to be flexible and to adapt its approach if things do not go to plan.